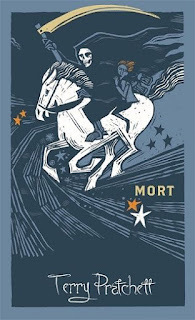 Mort was the fourth Discworld book written, the second published in 1987, and the first to have Death as a main character. The long and short of this one is that gawky, brainy but spacey teen Mortimer (Mort) isn't wanted around his family vineyard because of his tendency to ruin things so his dad and uncle decide he should find an apprenticeship. That job ends up being with the one and only Death. Why Death has decided to take an apprentice when he has the job for, well, life is unknown but the fact that he has a marriageable, adopted human daughter might be part of it. Question of the Day: Death has a soft spot for Discworld's kittens and cats. If you were not fully of this (our) world, what would be the thing that would attract/intrigue/charm you the most? My answer? I think it would also be the animals. The variety, the color, the adaptations. It was nice to see Death get so angry when he found a sack of drowned kittens. When I wasn't doing whatever I needed to be doing in my regular existence, I would probably be down here watching puffin parties or elephant families or whale migrations. I'm glad that you enjoyed this one so much! 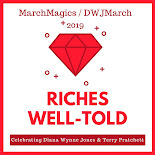 I think maybe because I just finished rereading my favorite Discworld series (Tiffany Aching), this wasn't as good in comparison. But I'm sure I'll warm back up to this series as we go along.